The Neretva Delta spreads over a large area some 2 hours drive south of Split. The region’s unexpected lush beauty divided in a patchwork of fruit groves, crops and canals. But more than just a verdant anomaly on an otherwise jagged seaside, the Neretva Valley is a cornucopia of culture. 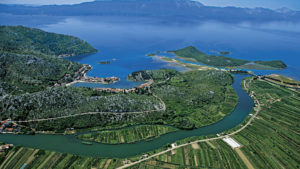 Surrounding the main towns of Opuzen, Metković and Ploče is a unique landscape of eight large lakes and fields divided by channels accessible only by boat. Tangerine and kiwi plantations stretch for 20km – you can even join the fruit pickers in late autumn. Near Metković is the archeological site of Narona, founded by the Greeks and visited by Julius Caesar centuries later. Its golden age came in 700 AD, when Narona was the second biggest town on the coast, ruling over 90 Illyrian settlements. Recently, it has come into national and international focus, prompting the arrival of scores of archaeologists, historians, scholars – and tourists. The reason for this flurry of interest surrounds the sensational findings unearthed here in the mid 1990s – and the attraction that subsequently opened in 2007. The Narona Archaeological Museum contains temple remains and sundry artefacts from the Roman and Illyrian periods. After the Romans, Neretva became a nest of bandits, inspiring the traditional boat parade held in Metković every August. When the modern warriors fight their way down to the Adriatic finish line and the reed-framed river world opens up to the sea’s horizon, it’s party time. As a new champion is crowned, the multitudes cover the harbour and bands oompah-pah to the rhythm of sloshing wine and the swirling of the cotton-candy machines. In restaurants, folks order platefuls of the region’s delicacies – roasted eel from the spit and breaded frog. The other reason people visit Neretva is for bird-watching. The swamps here act as resting grounds before the spring and autumn migrations. Good locations for include the lakes of Kuti, Desansko and Modro oko, all protected, and the Baćina Lakes. Of the 40 species that visit, you might see cormorants, great crested grebes, various herons and the exotic hoopoe. The landmark local hotel and restaurant, Villa Neretva, can also arrange lake safaris. The Illyrian, Hellenic and Roman history of Vid, today’s quaint settlement of stone houses, has mainly become evident through these archaeological discoveries. Before this, all that was known had to be gleaned through the writings of ancient historians and the passing mention of a handful of significant artifacts in the 19th century. Excavations really only began in the 1960s – with sensational findings discovered three decades later. The idea of creating a museum right on the archaelogical site centred on the original Roman concept of an Augusteum, established from the late 1st century BC. This was the most significant building of any Roman forum, and here featured a group of statues unique throughout the whole territory of the Roman Empire. After years of work, with special care paid to the ancient architectural structures and mosaics, the Narona Archaeological Museum opened its doors to visitors in May 2007. It was an immediate success. Along with the remains of a temple built in Corinthian style, the permanent collection includes a multitude of materials from various eras, dating from the Illyrian period to the turn of the fourth to fifth centuries AD, when the Augusteum was destroyed. Despite the quantity and variety of these exhibits, it is estimated that less than ten per cent of the local archaeological remains have been found. Since it is known that there were other temples and thermae in Narona, more significant discoveries should be expected. We run a tour to the Neretva area by special arrangement so please enquire for our fabulous day out to Neretva.